You have landed on the page for TGI Friday’s menu prices! T.G.I. 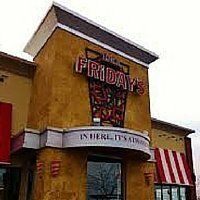 Friday’s is a casual dining restaurant chain famous for its legendary selection of drinks and authentic food items. Signature, hand-crafted food choices like starters, grill items, burgers, sandwiches, fish, salads, and soups served for lunch and dinner. You can also enjoy a seasonal rotation of special dishes. T.G.I. Friday’s is well known for their drinks, such as signature cocktails, crafts, drafts, & beers. There is a special place at T.G.I. Friday’s for kids with their own menu choices. Reservations are typically not required but recommended for special occasions and large groups. Below are the latest T.G.I. Friday’s menu prices. T.G.I.Friday’s Happy Hour is a great choice to meet friends and co-workers. Friday’s is the place to meet up, catch up and drink up (please drink responsibly). Watching a live sporting event at Friday’s is ideal. High-def, flat screen TVs in the bar area make you feel like you are right there in the middle of the action. Check out Friday’s new 474 menu. The menu consists of right size portions of Friday’s favorites for less. $4 for appetizers, $7 for entrees, and $4 for desserts. Consider it the next time you visit Friday’s. Also, back by popular demand, Friday’s brings back Endless Apps for $10 per guest of Friday’s unforgettable appetizers. Famous for their red-striped canopies, Friday’s now has a guest recognition program named after the red stripes. Friday’s is a great place for friends and they want you to be their friend. Sign up for the Give Me More Stripes(TM) and start collecting stripes towards free purchases. Every dollar you spend earns a stripe. That’s not all. Other perks of the program include complimentary dessert on your birthday, a preview of upcoming menu items, and the latest happenings at Friday’s. Friday’s works hard to make sure that complete nutritional information is available and accurate. Before you head over to your favorite Friday’s location, be sure to check out the nutritional information guide that provides details on all their dishes. You can also find this information at each Friday’s location. For those diners with allergies or gluten sensitivities, alternate menus can be requested before you order to help with your decision making. Love everything about Fridays? Are you a self-confident individual that enjoys working in a fun environment where you can be yourself and meet new people? That is exactly what it takes to be a team member at T.G.I.Friday’s. Head over to the Career page on their official website and learn more about current openings, flexible work schedules, and competitive pay and benefits packages. T.G.I.Friday’s is committed to operating in socially responsible manner and giving back to those in need in their local communities. Friday’s is a national Sponsor for Feeding America, a hunger relief program. Friday’s also strives to make a positive impact in communities by working with suppliers that understand the importance of treating animals with care and consideration. Allan Stillman opened the first T.G.I.Friday’s in 1965 in New York City. Allen’s reason for delving into the restaurant business was simple; he was looking for a place to meet single ladies. Allen’s choices for socializing consisted of male-dominated beer drinking establishments. Not the ideal spot to meet single ladies. So with some borrowed money and funds of his own, Allen forged ahead to create a spot where you could get a quality meal in a place that was inviting and friendly. For more information about T.G.I. Friday’s, visit their official website. What are the hours of operation at T.G.I. Friday’s? The majority of T.G.I. Friday’s hours of operation are from 11:00 am -1:00 am. Select locations may be opened later on weekends. Be sure to check your favorite location. Who owns T.G.I. Friday’s and where are they located? T.G.I.Friday’s is a business unit of privately-held investment firm Sentinel Capital Partners and TriArtisan Capital Partners. T.G.I. Friday’s is headquartered in Carrollton, TX. Today there are over 900 T.G.I Friday’s locations in 60 countries. Jack Daniel Ribs and Shrimp is 26.99 not 23.99 as listed above. the odds are that the prices have risen…But, wow! They are still so good! Wouldn’t you agree? i miss fried zuccini and combo nachos…they were the best! The last time I had a burger there it was well done and dried out out like a hockey puck, even though I requested medium to the waiter. I guess the cook didn`t understand him. I love burgers but will never order one there again. Very bad Vist to TGI Fridays in Las Vegas At Sams Town. On this page it says information was up dated on Nov 17th,2017. Prices were ALOT higher at the restaurant. Some of the Food was just plain AWFUL ( wasn’t cooked to order and the waiter just said sorry.) Will be calling corp office on Monday Nov 21st. I love the Jack Daniels Ribs, mashed potatoes and cheese and of course the Fried green beans. I always order the Jack Daniels sauce on the side and I love it that way. Thank you from Van Buren Arkansas. Wow my bill was100.00 was i surprised prices really went up you best believe I will still be back!! Tony is the best! !